Part of a prison in Kent has been evacuated after Legionella bacteria was found in the water system. Inmates in one wing of Maidstone Prison were moved to other jails, while tests on a prison officer proved negative, the Ministry of Justice said. Dr Mathi Chandrakumar, from Kent Health Protection Unit, said none of the prisoners had been affected. 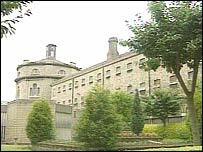 The Prison Officers Association (POA) said about 80 inmates were moved to other jails, some as far as Durham. A POA spokesman said the bacteria was found in the shower system in one wing. A spokeswoman for the Ministry of Justice said it was a mild strain of the bug and the evacuation was a precaution for the safety of prisoners and staff. "The prison is working closely with public heath officials, to ensure the process is carried out appropriately," she added. And she said the wing would be cleaned and then mothballed for pre-planned refurbishment in January 2008. Hospital tests were carried out on a prison officer on Saturday, she added. "The officer was discharged and returned to work the following day. The tests did not indicate that the officer has Legionella disease," she said. Maidstone MP Ann Widdecombe praised prison officers for acting quickly. She said the problem stemmed from overcrowded jails. Speaking to BBC Radio Kent, she said: "I'm not terribly surprised by it. "I think the prison service acted quickly. They warned me when they thought they had a problem. "It seemed almost to be five minutes later that they said 'Right, we're going to take action', so I think they've handled it properly." She added: "The problem is, when you've got prisons badly overcrowded as they are at the moment, and you are using what are described as Victorian wings, it isn't always possible to be using simply appropriate accommodation." The prison currently holds nearly 600 inmates in four residential wings and one segregation unit.